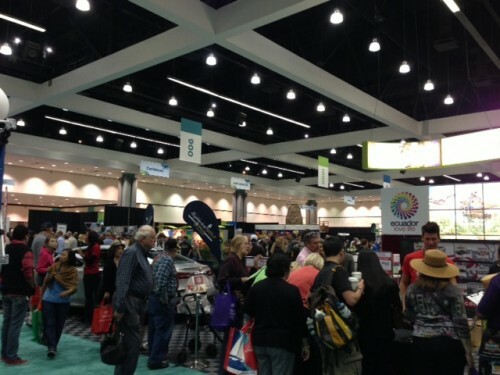 Ryan and I attended one day of the 2013 LA Travel Show – our first time at a travel convention. I found out about it after looking at Rick Steves’s website under the “Where’s Rick?” section (I like to see where he’s traveling – especially if he is filming new shows). After checking out the website for the travel show, I bought one-day tickets. 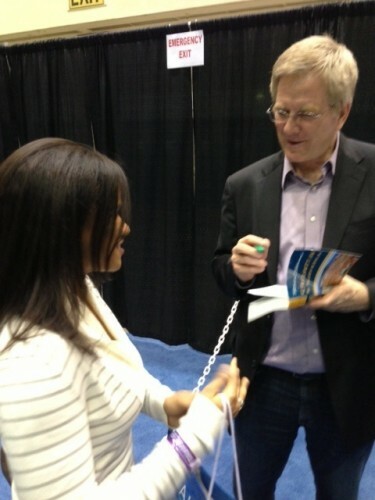 At $10 each, it was a bargain to be able to see Rick Steves in person. As an added bonus, we saw that Arthur Frommer and Phil Keoghan (host of “The Amazing Race”) were also speaking. We started out the day by wandering through the booths set up in a large, open room in the convention center. First up was the Singapore Airlines booth where we were able to sit in one of their first class “pods” – what an experience! Although I doubt I will ever be able to afford to fly in such luxury, it was fun to see what it would be like. Each pod is set up for one person, but the pods in the middle of the plane can be combined (the wall comes down) to form a larger bed and space for two! It’s hard to imagine having all of this room on a flight, just for me! We wandered around a bit before heading in to see Arthur Frommer speak in the large auditorium. The exhibition (pictured below) was set up by region and we spent most of the time in the European and Asian section. There was a mix of airlines, travel agents, tour companies, and more. By the time we left, I was hooked on the idea of a vacation in Asia. All of the destinations were so enticing – China, Thailand, Cambodia, Vietnam, Taiwan, and more! I’ve never felt less-traveled or had more of a desire to hop on a plane and explore a new place. It was so much fun to look at pictures and imagine a vacation in each destination. Since all of the speakers on the “big stage” were well-known, we decided it was worth our time to see each one. Arthur Frommer talked about travel trends (I plan to write a more detailed post on this later), Phil Keoghan described his extreme adventures, and Rick Steves’s talk was one we had heard dozens of times, as it followed his “Travel Skills” show (and podcast by the same name). Even having heard the talk before, we got a kick out of seeing Rick live. And as an added bonus, I had the pleasure of meeting him and getting his autograph! It was a fantastic finish to an already-amazing day. In addition to all of the fun we experienced at the big stage, there were also smaller stages set up throughout the exhibition that featured various travel topics, from what to expect on a cruise to must-have travel apps for your smart phone. There was even a cooking demonstration stage! I can definitely see the need for a two-day ticket to the event, if you really want to see it all. Overall it was a great way to spend the day, and I would consider going again next year, depending on who is planning to speak. At the very least, it got us thinking about new places to visit, and that’s something to look forward to! This entry was posted in Travel, Travel Planning by Kristin. Bookmark the permalink.